Although beautiful, Jelfs’s pieces are not breaking new ground. “In the 19th century it wasn’t uncommon to see flocks of humming birds on a single hat,” says Sharon Bainbridge from Stockport’s Hat Works museum. “Ladies wore huge hats piled with flowers, foliage, feathers and whole birds – they must have been incredibly heavy. The peak of this fashion for feather was between the 1850s and 1860s when we were importing four to five million birds a year to satisfy demand. then treating, dyeing and curling the feathers. The dyes were horribly carcinogenic and as the ladies often put the feathers in their mouths while working, many developed terrible illnesses. The Importation of Plumage (Prohibition) Act was passed in 1921. Typically, politicians were lagging behind style leaders of the time. The threat to rare birds had been limited years before as society ladies started to question the use of such feathers. “Most importantly, in 1906 Queen Alexandra announced she would no longer wear the feathers of wild birds. She was the Kate Middleton of her day and people took their lead from her,” explains Bainbridge. Money lives on a farm where she hand rears guineafowl, turkeys and chickens, so uses many of her own feathers. “People don’t realise how beautiful the feathers can be from everyday, domestic birds,” she says. “The variety of different shapes, colours and textures that you find on a single bird is extraordinary. “The tail feathers of a cockerel are particularly striking. Sometimes I cut them to leave just a tip, which creates an arrow shape. Turkey and goose are similar to each other. The feathers from the wing make really pretty feather flowers. They are also great to dye as they take up the colour brilliantly,” she adds. 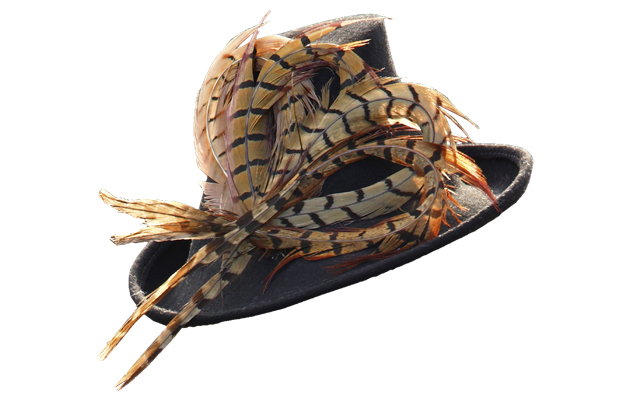 London-based milliner Judy Bentinck, who teaches at Central St Martins, has also come across aversion to peacock. “I’d never use the eye because they make many people feel uncomfortable,” she says. “I was asked by the British Museum to produce some hats for its shop but the museum specifically asked me not to use peacock because they have negative connotations in so many cultures. A bird sanctuary in southern England sends Goode owl and hawk feathers but there’s one feather she couldn’t work without. “The greeny-black feathers you find on a cockerel are stunning and so useful. Mallard is also brilliant. The shape makes it great fun and it is also fabulously malleable,” she says. There are rules regarding feathers from abroad and from wild birds, but gamebirds and domestic fowl are exempt. Always buy from a reputable source. Treat feathers before using them to remove insects. Dyeing also helps kill them off. Store feathers in a dry place with lots of space as once they have been bent into a shape they are hard to straighten. Small, fluffy feathers, such as guineafowl, are easier to dye than large plumes. The spines of large feathers don’t take up dye, so have to be coloured separately. Yvette Jelfs runs courses lasting from 21⁄2 hours (£150) to five days (£1,700) across the country, including in Edinburgh, the Borders and London. Call 020 7706 7632 for details or visit www.yvettejelfs.com. Helen Richardson, based in Shropshire, offers one- and two-day courses costing £100 or £200, including refreshments and materials. Call 01746 785140 or go to www.helen-richardson.com. Judy Bentinck runs fascinator classes (£145 including materials and refreshments) and millinery workshops from her studio in central London. Call her on 07966 272469 for details or go to www.judybentinck.com.